What is the difference between knit fabrics and woven fabrics? The problem with both questions is that fabrics can be knit/stretch and be 100% cotton. But people have come to confuse 100% cotton with woven. When you think of woven fabrics, think of fabric you’d use to make a quilt or curtains or upholstery. Woven fabric is generally crisp and not stretchy*. It can be as thin as chiffon or as thick as denim. *Some woven fabrics, like stretch denim or stretch poplin, have spandex woven in to give it some stretch. A stretch poplin may have 15% stretch across the grain, which means a 10″ piece of fabric can stretch up to 11.5″. When you think of knit fabrics, think of t-shirts and leggings. Knit fabric is usually stretchy and supple. It can be as thin as mesh or as thick as sweatshirt fleece. Knit fabrics tend to offer a superior amount of stretch compared with wovens, perhaps 30-50% for a t-shirt or up to 100% for something like a nylon spandex. 50% stretch would mean a 10″ piece of fabric can stretch up to 15″. 100% would mean a 10″ piece of fabric could stretch up to 20″. That’s quite a difference from the 11.5″ from the stretch poplin example. 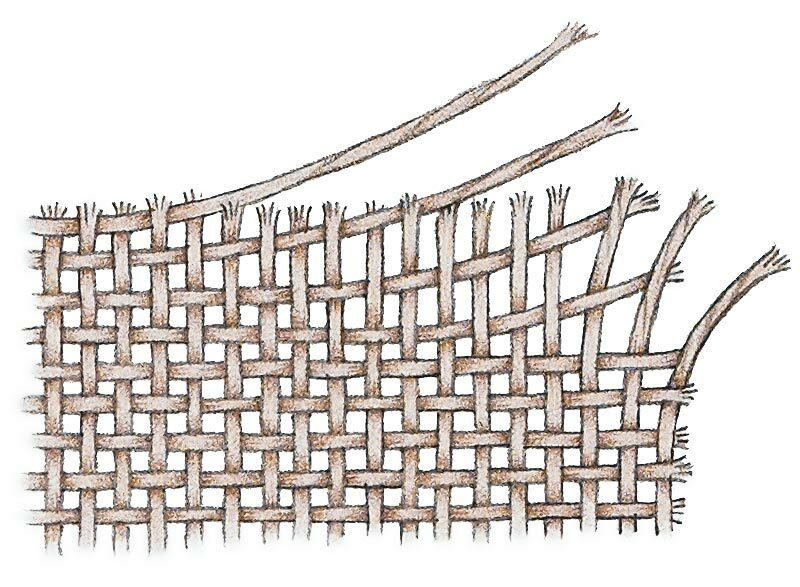 This handy little drawing (courtesy of Threads magazine) is a close-up of how woven fabric is constructed. Notice it’s a sort of basket-weave pattern, with the threads running perpendicular to each other. Each thread is separate from the next, meaning that when it’s cut, the edges fray. This is a close up of a knit fabric. Knit fabric is called knit fabric because it is literally knit- very similar to the way you would knit a sweater with a ball of yarn and knitting needles. It’s just usually done on a much smaller scale: tiny needles a very thin “yarn”. 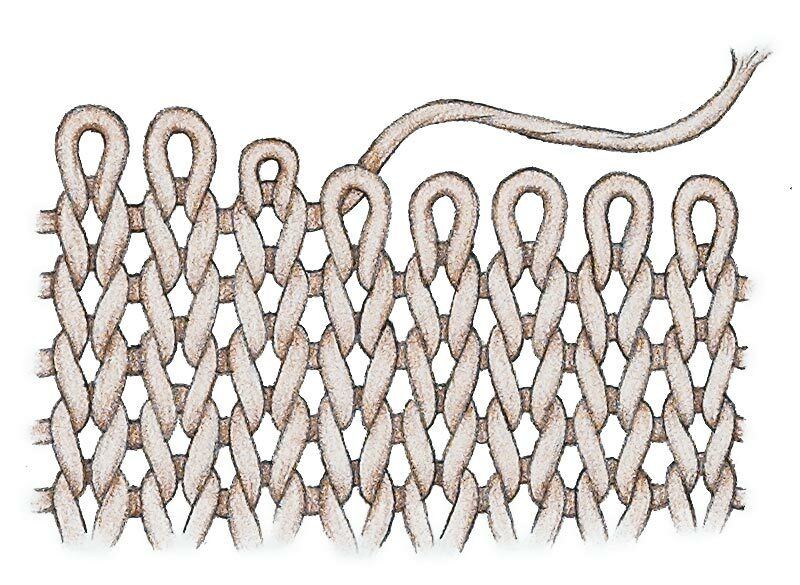 Knit fabric is all one continuous piece of thread (or close to it), so a raw edge usually won’t unravel the way it would on a woven fabric. And all of those interlocking loops are what allows for the natural stretchiness. So what about all that 100% cotton stuff? Knits come in the same variety of fiber contents as woven: 100% cotton, 100% polyester, cotton/polyester blends, cotton/spandex blends, wool, nylon, rayon, etc. Cotton/spandex jersey looks and feels almost the same as a 100% cotton, but I actually find it softer, and it offers a really awesome amount of stretch and elastic recovery: meaning it returns to its normal size after being stretched. If you’ve ever worked with a 100% cotton rib knit, you may have noticed that once it stretches, it doesn’t always unstretch all the way. Next time try a cotton/spandex rib knit. You’ll thank me. So one of the questions that is often asked is “Can I use a woven fabric for a pattern that calls for knit” or vice versa. If the pattern calls for knits, there is very little chance you’d be able to substitute a woven, even a woven with some stretch. The reason is that most knit patterns won’t have a closure like a zipper or buttons, relying on their stretch so that you can just pull them on. Think about the difference between a pair of leggings and a pair of jeans: there’s a reason the jeans have a fly. You probably wouldn’t be able to get them on otherwise. Aside from the closure issue, there’s the issue of fit. Woven patterns often rely on darts and fitted seams to make a garment fit the curves of the body. Knit fabrics tend to forgo darts and extra seams, instead relying on their natural stretch to fit the body. 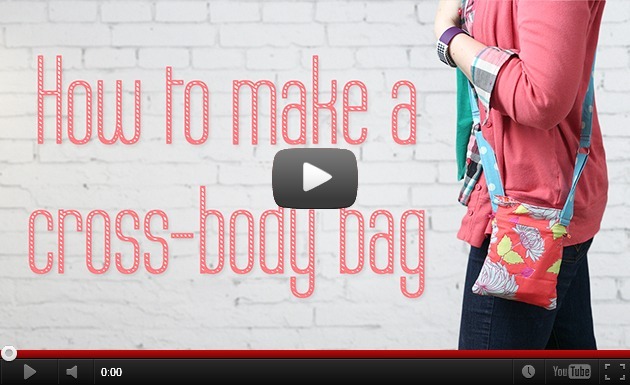 At best, using a woven fabric with a pattern meant for knits will result in something that fits like a paper bag. At worst, you won’t even be able to get it on. Sometimes you may be able to use a knit fabric with a pattern that calls for wovens. It really depends on the pattern and the particular fabric. Some patterns might be relying on the structure of the woven fabric to look right, and a knit fabric would sag in all the wrong places. But if you’re dying to use a pattern you’ve got for woven fabrics, but the fabric you’re set on is a knit, give it a shot. You never know until you try it. 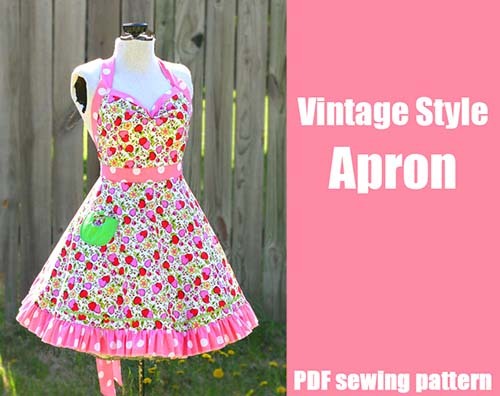 In my experience, most commercial sewing patterns are for woven fabrics. My patterns are a mix. The bustle and apron patterns work best with wovens. The rest require knit fabrics. Unless you live in a big city like LA or New York with a sweet garment district, chances are your local fabric store carries mostly wovens. I’d estimated that at least 85% of the fabric at the closest Joann Fabrics is woven. Where to find knit fabrics? 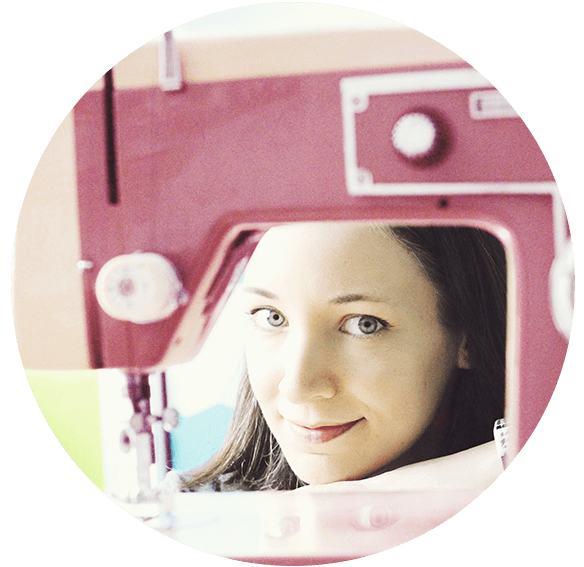 Here are some of my favorite online sources: Fabric.com, theFabricFairy, and GirlCharlee. There are also plenty of suppliers on Etsy and Ebay, like funkalicious fabrics and fabric_addiction. It can be difficult to deduce whether or not a fabric online is what you’re looking for, so the rule of thumb for knits is: if it doesn’t say it stretches in the description, it’s probably safer to assume it’s not a knit. Other words you might see instead of “knit” could be: jersey, interlock, ribbing, spandex, or simply “stretch fabric”. I love your informative post. It’s easy to understand too, for someone like me who has very little knowledge about fabric. Thank you! Excellent information, and exactly what I needed! This is spectacularly informative and I don’t even sew. Thanks! Thank you! It was so helpful! The best lesson I’ve had for woven and knit fabrics. Thank you. This is exactly what I needed! Thank you so much for all the detail in your description. Knitted Fabric always skin Friendly, natural stretch in all four directions ,hence can take shape of Human body with superior Drape as compared to Woven Fabric. But due to special loop structure the life of Knitted Garments much lesser than Woven Fabric. Therefore Woven Fabric is preferred than Knitted by adults and developing nation. 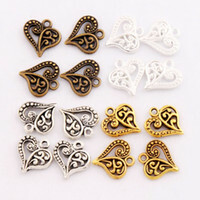 Dyeing Finishing and Printing of Knitting Fabric and ultimately patterning and stitching is different than Woven Fabric. Knitting Technology development now can produce Garments directly with computer aided design and measurements by complete by passing patterning and stiching. Can you explain to me what it means by cotton tissue knits? Is it similar to cotton single jersey? Tissue is usually used to denote that the fabric is very lightweight (sometimes semi-sheer). I would expect a cotton tissue knit to be similar to a lightweight cotton jersey, but “tissue” is one of those words that doesn’t really have a set definition. what material can we used to give spandex headband some support? trying to make my daughter head with team log.. and her number for baseball. It depends on what you mean by support. Do you want it to not stretch? Or do you just want it to be heavier weight? If you want to prevent stretching, you can use iron-on interfacing on the back of the spandex. You could use either. A lot of baby clothes (like the really basic tees, singlets, and onesies) are made from cotton rib knit. But I’ve also seen them in cotton interlock and cotton/spandex. in another article it says woven threads cross right angles…just the opposite of what this article says…. Perpendicular is the same as crossing at a right angle, as the drawing clearly illustrates. Am I missing something else in my post that contradicts this?